PhoneHK 討論區 - 新機試玩分享區 - Yota CEO expects to ring in good sales numbers in China - powered by Discuz! Six months after the debut in the cut-throat Chinese market of YotaPhone2, Vladislav Martynov, CEO of Yota Devices, sat down with China Daily to discuss his localization strategy, innovation philosophy and sales expectation. In November Russian president Vladimir Putin presented the Russian-designed, Chinese-manufactured YotaPhone2 to President Xi Jinping as a symbol of cooperation in the field of consumer electronics between Russia and China. The phone features a quad-core 2.2 GHz Qualcomm Snapdragon 801 chip, a 5-inch, 1080P AMOLED screen and a 2GB random access memory. Unlike other standard Android-based phones, flipping the phone over reveals the E-ink display which uses zero power unless it is refreshing to receive new information. 1. What are your business strategies in China as you readjust to the new Chinese economic policies and realities like the New Normal, the One Belt & One Road initiative and the Internet Plus initiative? "I think the "One Belt & One Road" initiative is a very good strategy to unite all nations in a joint effort of economically beneficial collaboration. From my understanding, it means that countries on this road or belt should collaborate more for being comparative in the global market," said Martynov. According to Martynov, YotaPhone is a good practical example to show how to implement the plan. On September 15, the company signed cooperation agreements with a Shenzhen ZTE Supply Chain Co Ltd (ZTESC), an associate company of Chinese tech giant ZTE Corporation, and Shenzhen X&F Technology Co Ltd, an ODM that focuses on terminal products in the field of communications, aimed at producing innovative products. "New Normal means to pay more attention to qualities rather than quantities in regarding to economic development in China," said Martynov. In terms of the "Internet Plus" initiative, Martynov pointed out that the consumption of data and the use of smartphones will be as simple as possible so people will get benefits without any barriers. 2. Economic slowdown pressures have increased in China since the second half of last year. During the first six months of this year, GDP growth has fallen to 7 percent, while deflation pressures have risen in the manufacturing sector. Against this backdrop, what are the challenges you have faced or continue to face in China, especially with regard to business development strategy and operations? "You can have good times or you can have very good times. I think what China has benefited from the last few years, is very good times in terms of economic growth. Right now, despite the fact that it is slowing down, I still believe that compare with the other countries in the world, China is still in the good times," said Martynov. He used iPhone as an example to explain that innovation is usually the driver of the industry and the smartphone market. Although the first generation is twice as expensive as other cellphones, it triggered a big demand in consumers because it provided problem solutions for users and offered convenient experience. He is optimistic that as a newcomer to the Chinese market, taking a few percent of the market share means big success for Russian start-ups and the innovative genes of YotaPhone will take over the slow down and capture the hearts of buyers. 3. 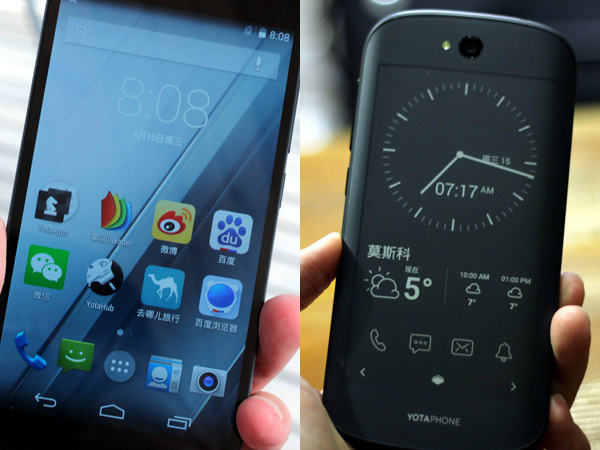 How would you rate your company's performance in China after the debut of YotaPhone2? Over the next three years, do you see an increase/decrease in China's contribution to your global business? Having said that, do you also foresee any major risks in the China market over the long term? "Currently, the selling performance of YotaPhone2 is in line with our expectations, but we definitely expect substantial increase and growth in China over the next one to two years," said Martynov. He expects a big jump in the product's sales volume in China, which will be a tidy contribution to the company's global business. 4. What's your advice to China's young entrepreneurs? "They're quite lucky to have been born in this country, because opportunities in China, particularly during the time we are living, are unlimited," said Martynov. "Don't be afraid to try to make your start-ups, to start your business, to bring your technologies to consumers and the market". Martynov pointed out that being persistent; believing in your ideas and technologies, collecting feedback and thinking globally are key pieces of advice for China's young entrepreneurs.